Get your day going with a delightful fruit smoothie anchored by our powerfully nutritious greens: Power, Kale or Baby Spinach! Wholesome organic frozen fruit and fruit juice impart a gently sweet flavor, and they provide the perfect cover for adding healthy veggies to your diet, even if you don't particularly like to eat your greens straight up. 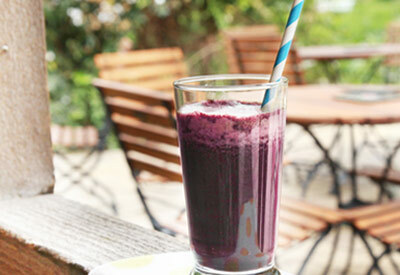 This smoothie makes a terrific on-the-go breakfast or refreshing midday snack. Makes one 12-ounce smoothie. Enjoy! Nutritional Values using Power Greens. In order, add ingredients to a blender or juicer. Secure the blender lid and hold it to prevent leaks. Blend until smooth. Serve immediately.